Score 5 points for each of your staffed ships that has its Commander aboard at an opponent's non-headquarters mission. Destroy this event. "I know that we will pay a heavy price for every system we take from them. But in the end, that's the only way to drive the Dominion out of the Alpha Quadrant. And that is a goal we all share - Klingons, humans, and Romulans." Characteristics: score points, ship related card. 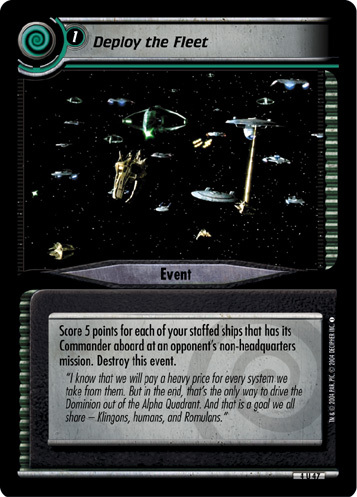 There are 10 entries for Deploy the Fleet (ST2E 4 U 47) at the Tradeplace (4 haves and 10 wants). Click here to see all trade list entries for this Uncommon card!